Throughout the week, some people in Cochabamba had worried about how September 13, a date expected to involve confrontation between the supporters of the government of left-wing, indigenous President Evo Morales and the right wing, would turn out. People at work talked of a coup. Others remembered the protest of on January 11 when tree people were killed and some buildings burnt, worrying that the same would happen again. Some of the most right wing spoke of a campesino “invasion”. The opposition attempts to divide the country with talk and hunger strikes over where the country’s capital should be in the new constitution. Some people have accused Evo’s government of seeking to divide the country after it encouraged cocaleros (coca-growers) to come to Cochabamba city. But the fears and rumours were utterly unfounded. Today, September 13, also Cochabamba Day (a day of bands, arts, plays and celebration) was a peaceful and joyful day, as Evo announced that he was giving 90 tractors to 45 Cochabamba municipalities. Tens of thousands of people gathered in Plaza San Sebastian, as well as on the hill behind it and in the surrounding streets, to demonstrate unity. The protest was initially called in retaliation to a call by the prefect of Cochabamba, Manfred Reyes Villa, for Evo to resign. However, by the day of the rally it became more of an occasion to receive the tractors and to celebrate the anniversary of Cochabamba state. 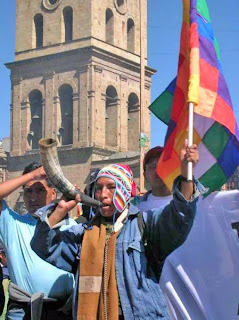 Braving the heat, using Bolivian and Whipala flags (a rainbow flag that symbolises both the diversity and equality of the indigenous populations) for shade, campesinos, cocoleros, indigenous people and urban workers gathered to listen to Evo speak, as confetti and chewed coca covered the plaza floor. The president’s speech emphasised unity — “We are all Bolivian” — argued with the countless “lies and accusations” of the right, and congratulated the revolution’s progress in “liberating Bolivia”. It was punctuated with well-received jokes and the government’s slogan, “Bolivia changes, Evo achieves”. Finally, the communities with their tractors — decorated in flowers, vegetables and Evo posters — paraded through the crowd and past the president, throwing confetti, setting off fireworks and waving, with giant grins and yells of “Thanks!” to the president and the crowd. The opposition would have loved the day to be violent. The people who attended the rally have demonstrated that they are not at all what opposition characterises them as — they have suffered a lot of violence in the past, during the coca wars, in their poverty, and from dictatorships. Visit Tamara Pearson’s blog at http://gringadiary.blogspot.com.